The 2016 Olympics have been eventful for Chinese diver He Zi. First she won the silver medal in the 3m springboard diving final on Aug. 14. Then, on her way down from the podium, her boyfriend proposed to her. He said yes to her boyfriend of six years, fellow Chinese diver Qin Kai, who won bronze in the men's synchronized 3m springboard on Aug. 10. Qin got down on one knee, speaking to He for a while, then pulled out a red box. Along with the ring, Qin gave He a red rose in a glass case. After, the couple celebrated, with Zi telling reporters, "He said a lot of things at the podium. He made a lot of promises, but the thing that has touched me the most is that this is the guy I can trust for the rest of my life." 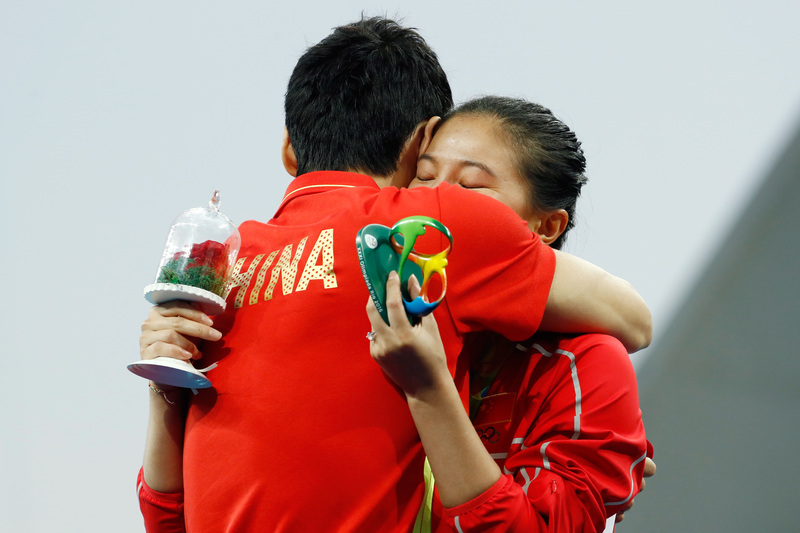 He's teammate Shi Tingmao, who won the gold medal in the event, knew about the proposal beforehand, and gave Italian bronze medalist Tania Cagnotto a heads up before the ceremony. The engagement is the second to occur during the Rio Games. Brazilian rugby player Isadora Cerullo got engaged to her girlfriend and Olympic stadium manager Marjorie Enya on Aug. 8. Rather than a ring, Enya tied a gold ribbon around Cerullo's finger. Not everyone is excited about He's engagement — or at least the timing of it. On Twitter, users have pointed out how quickly following the medal ceremony Qin got down on one knee, and questioned if the engagement overshadowed He's accomplishment. Is proposing at the Olympics sweet, or a stunt that results in more coverage? Considering some of the conversations about female athletes thus far in the Olympics, it's a tricky question. The Associated Press took it a step further when they published a news article about the event. They wrote that He "settled" for the silver medal, "before accepting an even bigger prize: an engagement ring." While it's fun to write about such an unusual event taking place during the Olympics, that language is pushing it. Yes, an engagement is a big part of someone's life, but to win an Olympic medal is also a huge deal, and it should be treated with respect and not downplayed by anyone. Watch the video of the proposal and celebrate for He and Qin, but don't forget to celebrate her huge accomplishment, too.